We have breakfast in cabanas before we go to The Senses Spa for our day pass in the Rainforest room. We are given robes and slippers and then shown where to go. The various showers have different temperatures, sprays, smells and sounds e.g. Atlantic Storm, Waterfall, Tropical storm  some are warm some very cold. 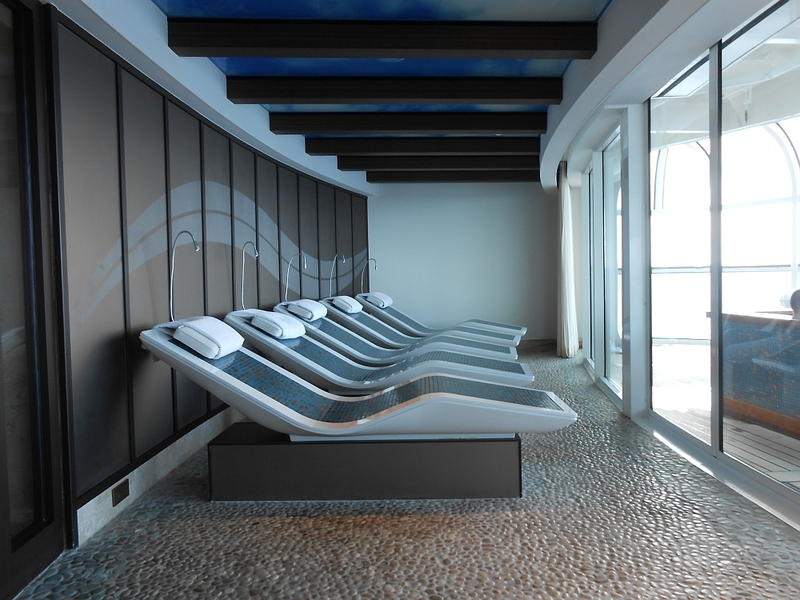 You can also use the steam rooms, saunas  some of the rooms were so hot you had to sit on a towel. One of the cooler rooms has a window to the outside so it was lovely to sit there and watch the ocean slipping by. I use my orange and vanilla scrub as advised  putting it in a warm room to make it easier to apply  such a gorgeous scent. 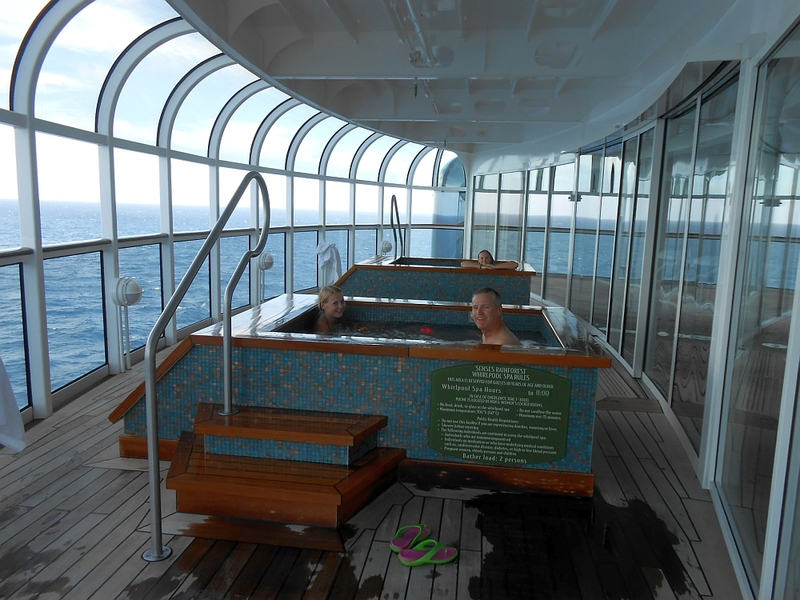 We meet up on the heated ceramic loungers, which overlook the hot tubs and the sea - it is very peaceful and calm in here and I found it very enjoyable. We enjoy the hot tubs, read and generally enjoy the peace and quiet all morning. At 1.30pm we go to the adult deck area above the adult pool, to find four loungers  again it is very quiet. For lunch we go to Eb and Flos  Georgia has pizza, India and I have chicken tenders, Kev beef and mustard sandwich. We try to limit the amount we are eating as tonight we are going to Remy and we dont want to be too full like we were at Palo last night. We go to the cabin to shower and change into our finery  we leave the girls getting reading as Kev and I have an invitation to meet the sommelier in the Meridian bar at 5.30pm  he is very interesting and gives us a bit of information about the meal and about the wine choices on offer, the wine pairings and the prices of glasses of wine (from $10.50 a glass to $25,000 a bottle). 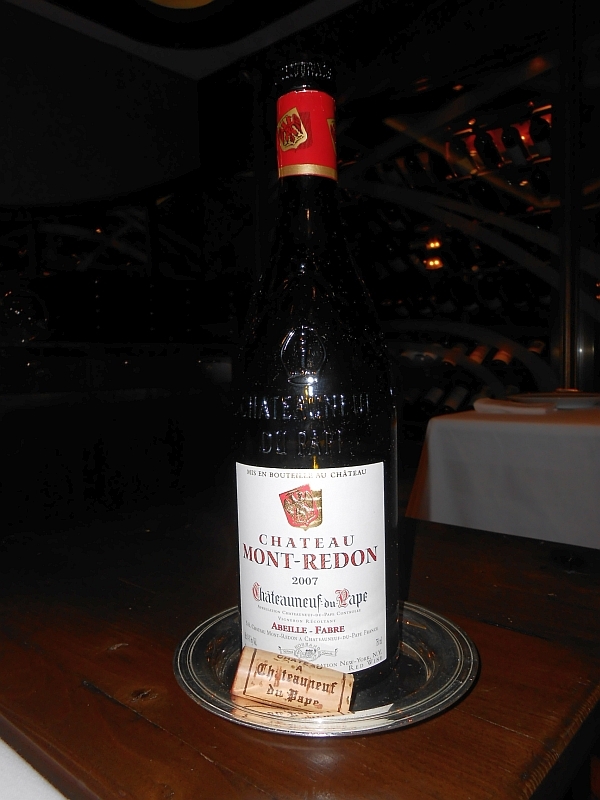 He listens to what sort of wine we enjoy and then suggests one which he is says is very underrated but he can guarantee in a few years time it will be very expensive  when we enquire about the cost of this bottle he states $265  we gulp and say it is a bit out of our budget and that we will choose a bottle tonight. The conversation only takes 10 minutes so we go to the Bon Voyage bar situated in the atrium. The advantage of having the tracker phone with us is we can let the girls know where we are at any time  this is a great idea and we found it very useful. 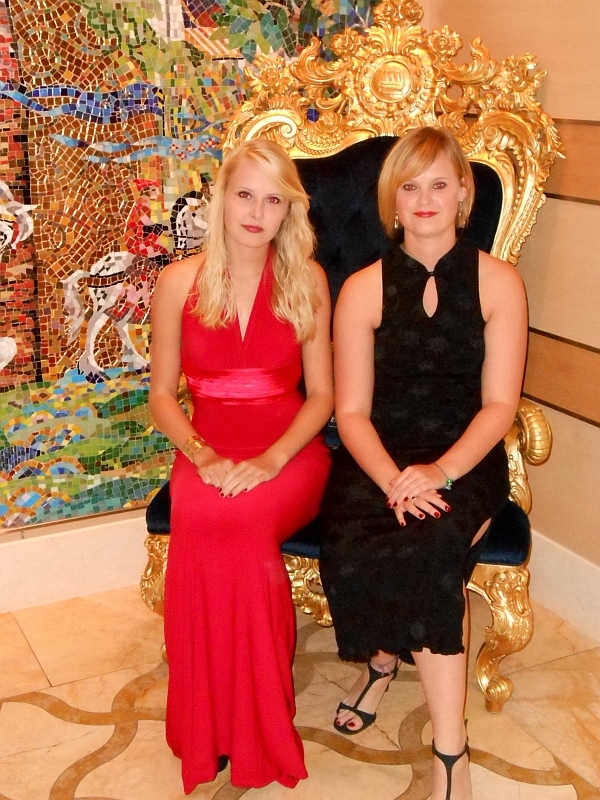 I have a lemon drop and Kev has a pomegranate Cosmo, the girls join us and we take some photos of us all in our evening wear sitting in the throne against the wonderful mosaic. We go to the Walt Disney Theatre to watch Believe  the final show which is fun but we misjudged the timing and rushed to Remy arriving just in time for our 7.15pm reservation. We are shown into the wine room  how wonderful to have this very private area just for the four of us  the service here is exemplary. Georgia chooses a Linguine cocktail  which has amongst other things fresh raspberry puree, jasmine tea and passion fruit  this was her favourite drink of the whole holiday. We are all given a champagne cocktail Collette  at the bottom of the glass is a blueberry and a mint leaf this is covered with champagne and a splash of pear vodka and then finished with a piece of dried apricot  delicious  if this is a taste of things to come I think we are going to have a fabulous night. The headwaiter asks which of the two menus we would like to choose from  the menus were created by Scott Hunnel from Victoria and Alberts restaurant and Chef Arnaud Lallement from LAssiette Champenoise, a Michelin two-star restaurant located just outside Reims, France. Alternatively he said we could chose from the a la carte menu or we could tell him the sort of things we liked and he would create a menu from a mixture of everything on order. We decided this was definitely a good idea so we told him a little bit about what we particularly liked and disliked when it came to food. His choices were superb and we were so pleased we took this option. 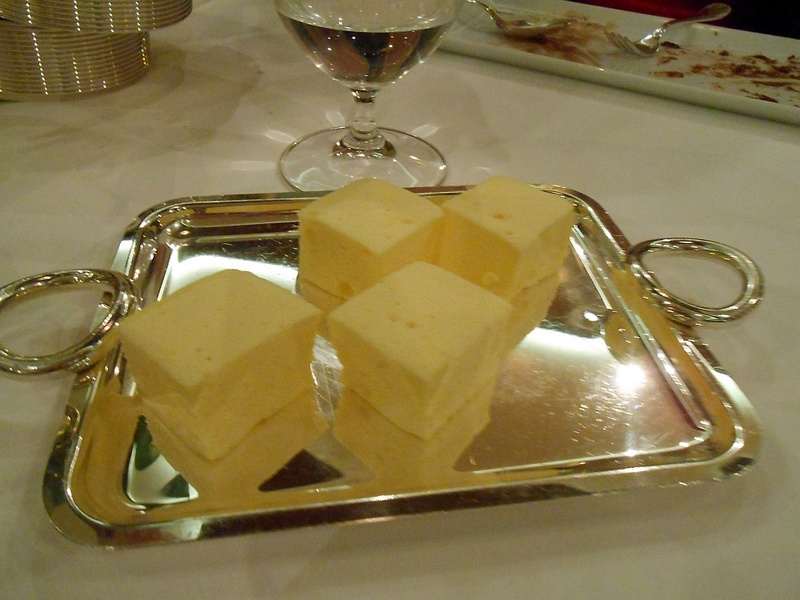 Firstly we are presented with an amuse-bouche  this is a bite sized crouton with hot tomato soup inside  we are instructed to put it whole in our mouth and then bite into it  how fabulous what a wonderful idea  so very clever and with a delicious flavour too. There is also a basket of beautiful hand made French breads with unsalted butter and fleur del sel by the side. 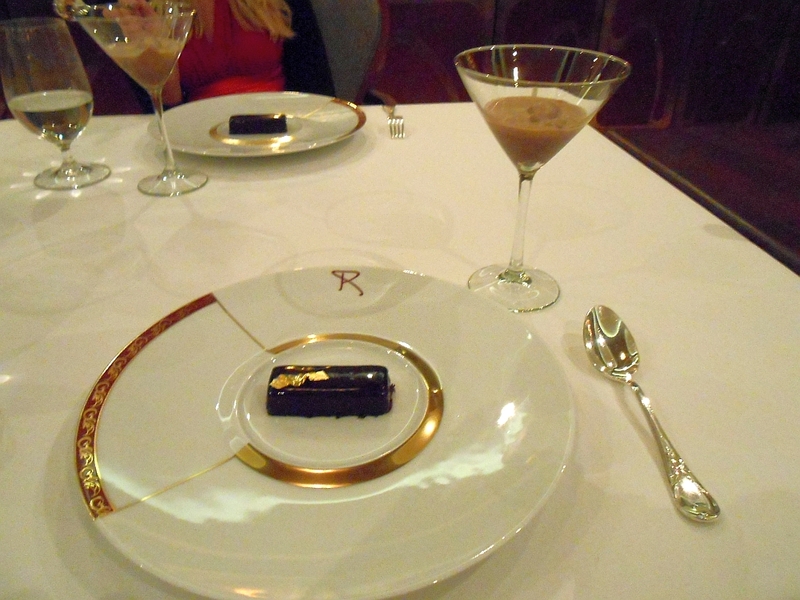 The attention to detail is breathtaking and it is no wonder this is considered the finest restaurant on any cruise shop. 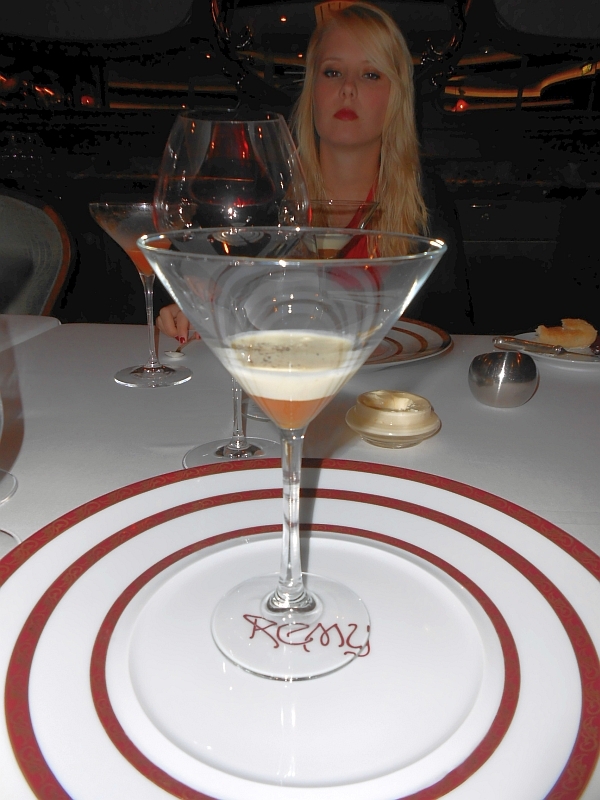 We were then given a glass with salted caramel and macadamia nuts in the bottom covered with a foie gras foam and a sprinkling of black pepper  wow what a stunning flavour combination  it just worked brilliantly. 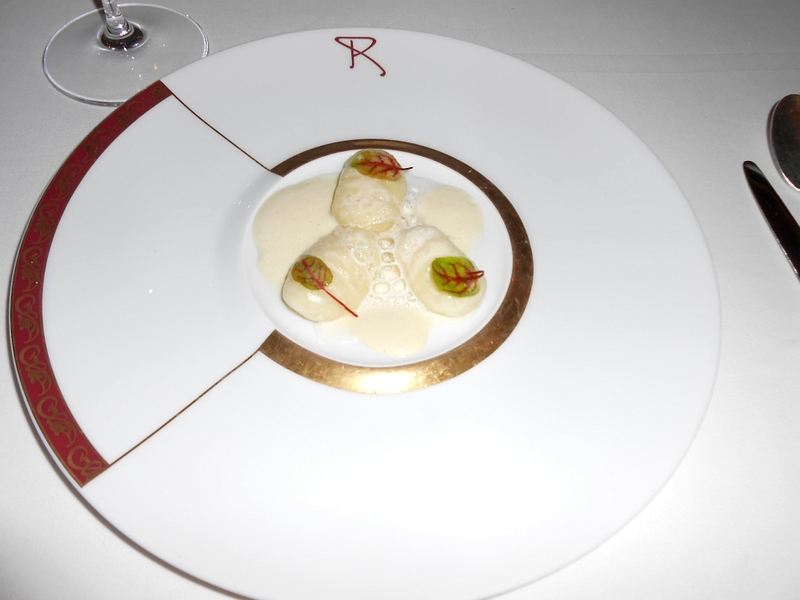 Next course is Vin Jaune Gnocchi  gnocchi made with golden Yukon potatoes with yellow wine sabayon  the wine takes 7 years to reduce from 30 litres to 3 litres and this gives it a wonderful nutty flavour which, whilst not suitable for drinking, gives it a real concentrated flavour perfect for this sabayon. 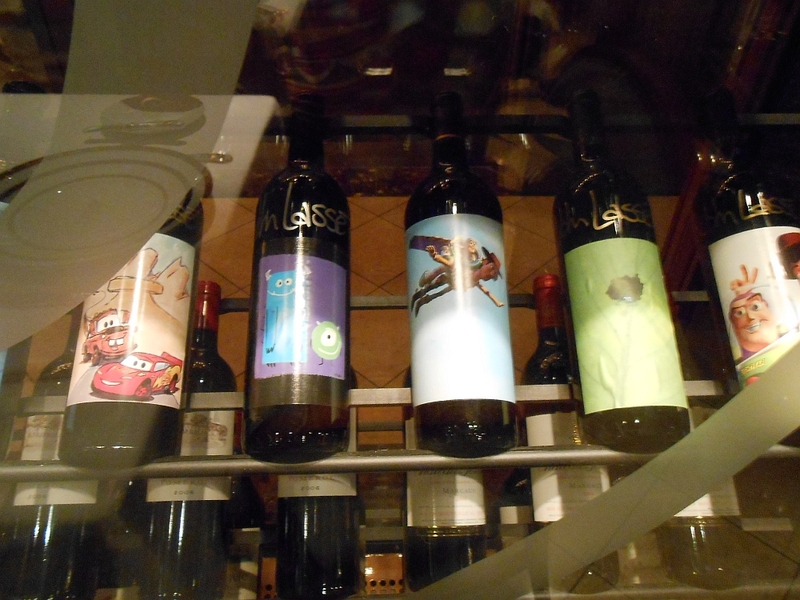 In between courses the waiters and sommelier show us the various bottles of wine situated in the various cabinets around the room  there are also a selection of wines in bottles with labels designed by John Lasseter and he has signed these. 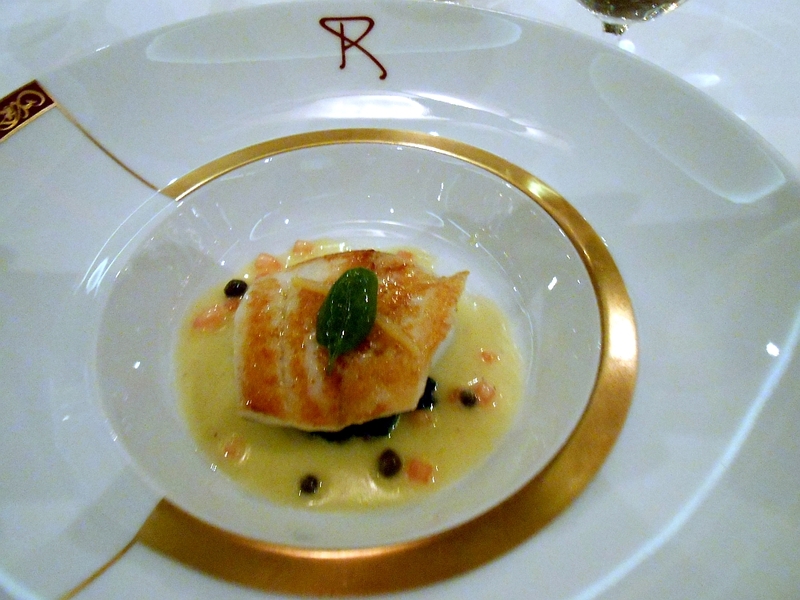 Following the gnocchi we have turbot  seared on one side on a bed of spinach with lemon butter sauce with capers and tomatoes. 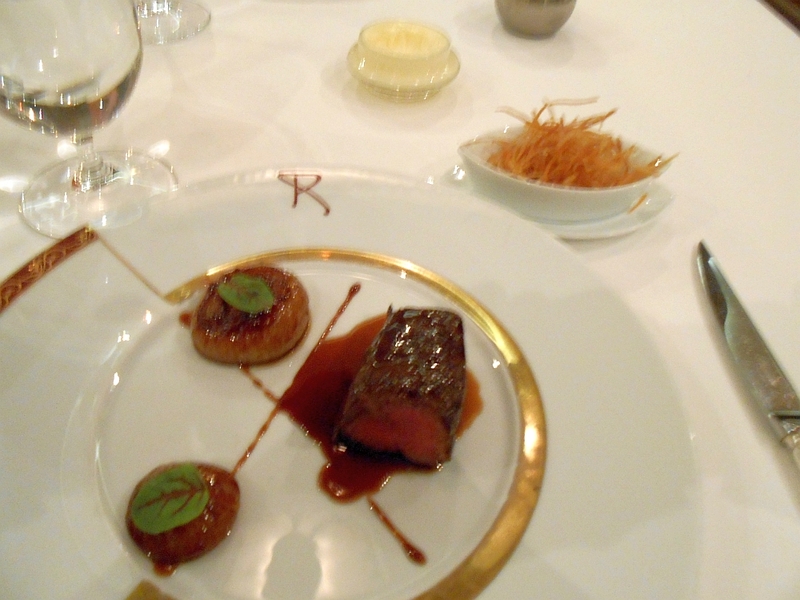 This was light and zingy and perfect as a lead up for the next course, which was meat based. Herb and panko crusted lamb with candied marble potatoes and carrots  the crust had mint, parsley, chive and chervil in it and the combination of the flavours was perfect. 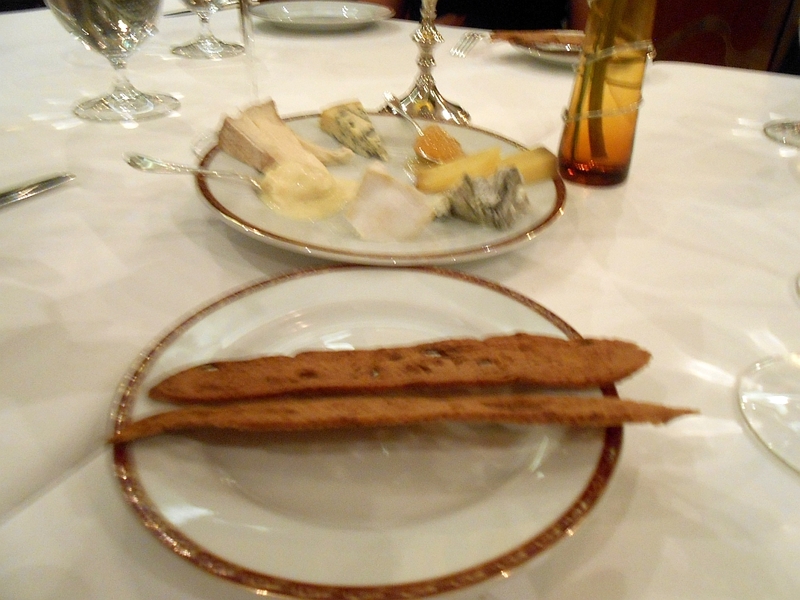 Next out was an incredible selection of cheeses  we chose a few including goats cheese and a cheese coated in ash  a honeycomb and a selection of breads accompany these. 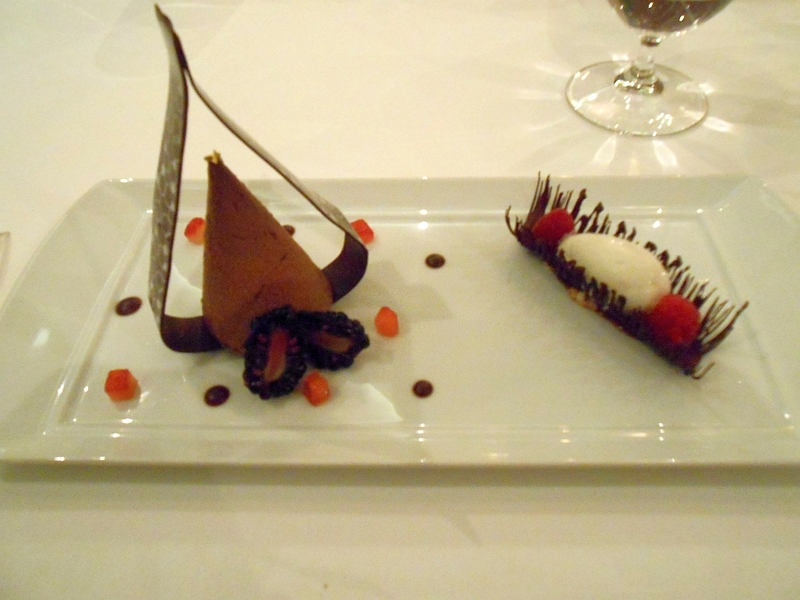 The next dish was a selection of chocolate puddings: a crunchy chocolate cake layered with chocolate mousse, covered in dark chocolate and topped with gold leaf, a chocolate mousse complete with chocolate Remy ribbon, this was served with chocolate eyelashes with milk gelato and fresh raspberries, sabayon and spiced chocolate sauce. 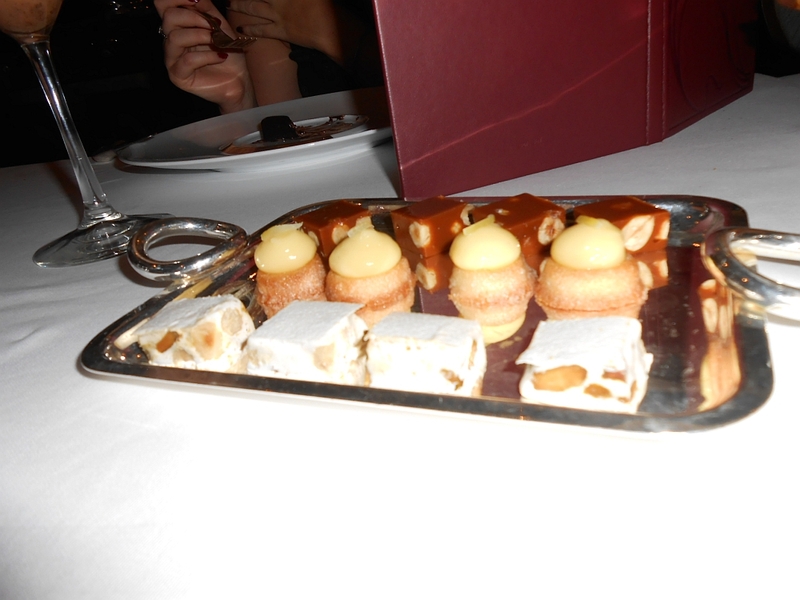 If we thought this was the big finale we were wrong and we were then presented with a tray of assorted handmade sweets  a mango marshmallow, blueberry and coconut giant lollipops, macadamia salted caramel, nougat with almonds, lemon sponge and small rum cakes. 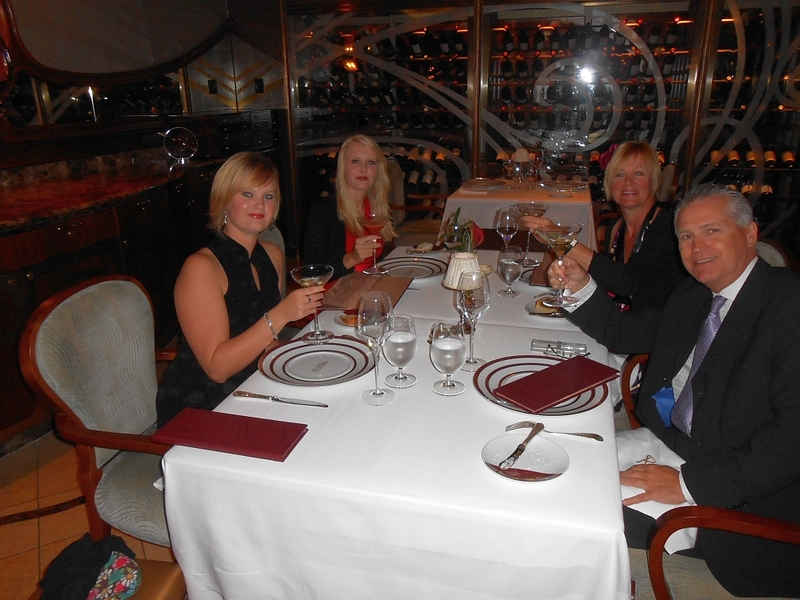 Wow what a truly amazing meal  I have had some fabulous meals in the past including Victoria and Alberts in Walt Disney World and on the Orient Express and this definitely ranks up there with the best of them  how they manage such great quality and presentation on a cruise ship is a true wonder. 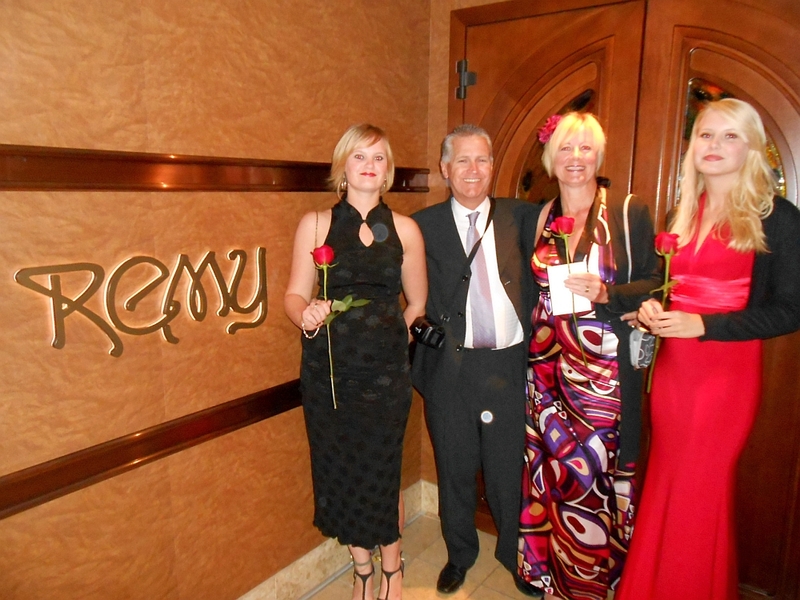 We left the restaurant at 10.30pm and each of us ladies was presented with a long stemmed red rose (no thorns) and 2 small boxes of hand made chocolates. 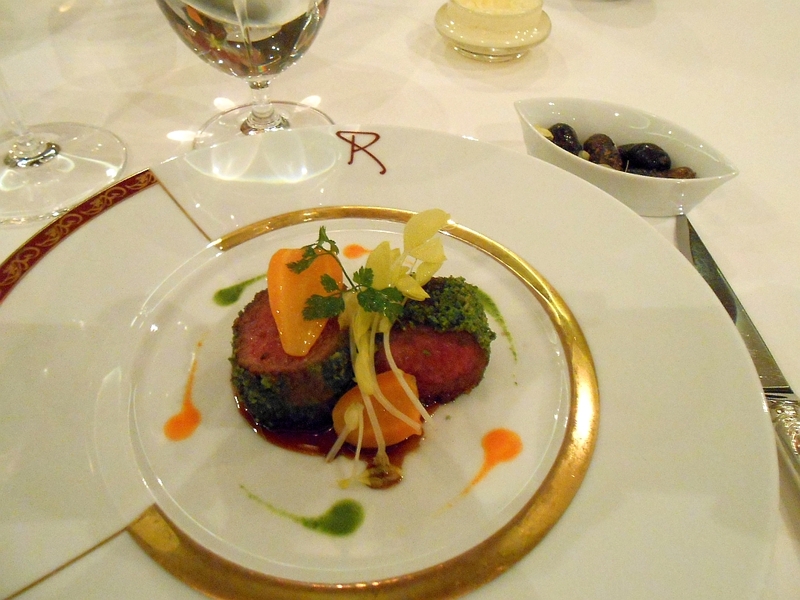 The meal cost $460 including tip  the price of the meal being $75 each.